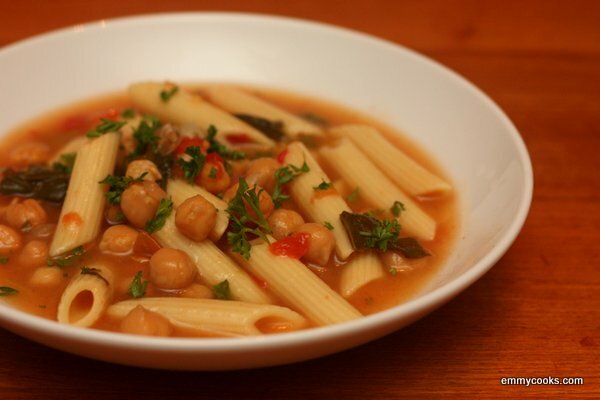 15-minute Pasta e Fagioli: Bring 6 c. of water, vegetable broth, or bean cooking liquid to a boil (I used 2 c. chickpea cooking liquid plus 4 c. water plus 1 tsp salt; the amount of salt you need will vary if you use water or broth) and add 1 c. penne or other short pasta. After 5 minutes, add a big handful of sliced greens, then a minute or two later add 1 ½ c. drained chickpeas or other beans and 1 ½ c. chopped tomatoes. When the beans are warmed through, add 1 tsp. finely minced rosemary and additional salt and pepper to taste. Garnish with parsley and grated Parmesan if desired. I have never heard of a semi-dried bean! I enjoy both fresh and dried beans but am intrigued to learn (after a bit of internet research) that there may be another option. I will have to see if my farmers’ markets offer any such thing this fall. Thank you for the introduction to another bean option! You did well: it DOES make me want to eat it. ;) Oh, and butter beans also go really well with this type of soup. Oh, good. It was worth it! :) Mmm, butter beans. You’re right! Glad to hear it! Enjoy. This is pretty much my favorite soup. Peasant food is the best! Thanks. We have a cold over here and noodle soups are favored with the little people. I’d be dearly tempted to through a little kale on top…. Yum. One of my favorite soups, especially with crusty bread to dip in. I actually just used your recipe to make my own chickpeas last night! I’m so glad you told me to save the cooking liquid, too. It has been the opposite of soup weather around here, but I’ll try to freeze it so I can try out your pasta e fagioli soon. That’s totally going down in my house this fall. I saved my chickpea liquid from my slow cooker beans! You eat with your eyes first, right? I have the same battle…and sometimes my family resists their dinner’s photo shoots. Soup looks yummy. Great blog!